Founded in 1986, A & I, Inc. has three decades of experience in environmental management. A & I, Inc. has successfully completed over 20,000 environmental abatement projects. Our spectrum of clients includes schools, churches, synagogues, hospitals, manufacturing plants, government buildings, apartments, universities, and private homes and businesses. Careful planning, well-trained staff and years of project experience ensure minimal inconvenience to building owners and occupants. A & I, Inc. has secured A+ rated pure occurrence insurance and bonding. Each employee has been trained and certified through independent EPA and AHERA - approved courses for workers and supervisors. They have also received training in mold remediation. 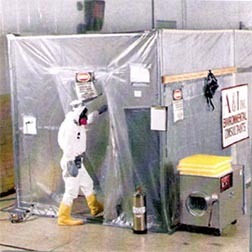 Employee safety, as well as the security of all building occupants, is foremost in performing all aspects of environmental remediation. An experienced team member can evaluate, recommend and execute the most cost-effective solutions. Asbestos and lead were once widely-used materials in the construction industry. Today we know these materials as dangerous. Many building owners and managers of hospitals, schools, and municipal buildings have now been confronted with remediating these hazards. One of the latest environmental awareness concerns we have been confronted with is mold. Exposure to mold can produce a variety of symptoms such as allergic reactions, inflammatory skin conditions, breathing difficulty and headaches. Mold needs only moisture, lack of light and the proper temperature to pose a serious threat to good health. 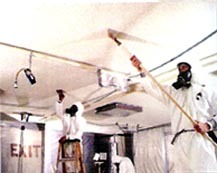 For further information on asbestos, lead, or mold please visit the Environmental Protection Agency (EPA) website links below. Copyright © 2009 A & I Inc.